Tonight, members of the VGSN attended a Fam Tour at Canoe Brewpub, Restaurant and Marina. Canoe Brew Pub is found at the foot of Swift Street on the Inner Harbour. 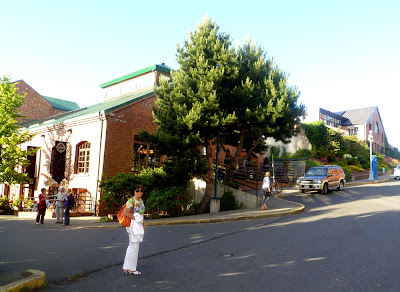 It has the best waterfront patios in Victoria with a western view and great sunsets. The Brew Pub is located in a soaring, old timber frame structure with brick architecture. This character building showcases the brewery at one end, with a pub, lounge, upstairs dining room, large outdoor patio and free parking. The service is great with plenty of staff, who were very helpful. The Pub could easily handle groups of all sizes. Thanks to Taryn Stewart, Event Coordinator, and servers Sophie and Caley for the great job they did taking care of our group. We sampled four different handcrafted beers: Belgian Blonde (a seasonal beer), Red Canoe Lager, Beaver Brown Ale, and River Rock Bitter. The beers were accompanied by a selection of great appetizers offered in the Brew Pub. The appetizers were unique and different from your standard pub fare. We were treated to duck flatbread, fried oceanwise squid, crispy polenta, cauliflower and corn fritters, albacore tuna, prosciutto wrapped asparagus, grilled bread, marinated olives, oceanwise mussels, and messy fries. All were delicious. We were also guided on a short tour of the brewery. My vote went to the River Rock Bitter (an award winner), the mussels, flatbread, and the squid. Linda loved the prosciutto wrapped asparagus and crispy polenta. Chef Gabe Milne has created an eclectic menu (see http://www.canoebrewpub.com/menus.php ) and he calls it real food because they use locally sourced food, showcasing local farmers, highlighting seasonal organics, local quality meat and only oceanwise sustainable seafood. Presentation of the food is important and it tastes as good as it looks. Thanks everyone at the Canoe Brewpub. For more pictures of this facinating business go to our Facebook Page.